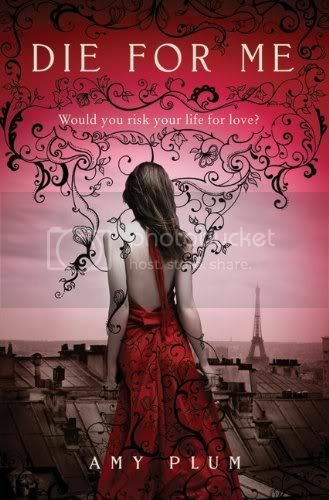 Die for Me - After the death of her parents, Kate and her sister move to Paris, France to live with their grandparents, in hopes of starting a new life for themselves. Kate doesn’t want anything to do with friends or boys, until she meets the charming Vincent, who makes her feel alive again. But Vincent also has a secret, and Kate must decide if he’s worth risking her heart over. Wow, this book was really great! The story and characters had me hooked from the beginning, and I had a really hard time putting the book down. It’s definitely a book that will be added to my collection. The story is absolutely fascinating, and not really what I was expecting. I really connected with the main character, her pain and grief. But she was strong and determined, and while she was grieving, she didn’t totally give up hope. Vincent wasn’t the perfect ‘hero’, by far. But he really cared for Kate, even when he was torn about having her in his world. The secondary characters were well written as well. Jules and Ambrose were really funny, I found myself laughing at them more often than not. The plot is fast paced and interesting. The writing and descriptions were well written and beautifully described. The ending left me satisfied, but I’m also anxiously looking forward to the next book in the series, coming out next year! Thank you to HarperTeen and Netgalley for allowing me to read and review this book! I've seen a lot of hype about this...this review makes me want to read it even more! Yay! Glad you loved it. I shall start reading this in the next 24 hours. Amy Plum is just fab and this series will be huge! I have an ARC, too, but it's still in my reading pile :( I hope I get to read it really soon, I hear lots of good things about it! I have this waiting for me to read on NetGalley also. I am so very excited about it!!! Great review! Thanks for stopping by everyone! This was really great, and I am looking forward to seeing what you all thought of it! I'm so looking forward to reading this! Great review, now I want it even more! I am looking forward to reading this one. I too was lucky enough to pick it up from NetGalley for review. I'm glad you liked it. I have to get through The Goddess Test, first then this one will be my next book. Fantastic review. I am really looking forward to reading this. I've heard nothing but good things about it. I can't wait to read this! Reading your review adds more to my excitement :) Great review and glad you enjoyed it. I fell in love with this book cover its one of the prettiest I've seen by far. I'm looking forward to reading this one soon. Definitely adding this one to my TBR list i liked your review really makes me want to read it. Glorious! So glad you liked this! I have the NetGalley copy as well and am so looking forward to reading it! LOVE the cover! I didn't request this one from NetGalley, but I may have to now! It sounds great!! I read this one as well, and I enjoyed it. However, It reminded me a lot of Hush, Hush and Twilight. Great review! I loved this book :) Can't wait for the second one to come out! :) Nice review!